Why is it that we always wait until something like this happens to start the dialogue about the wonderful things that a person has done. Why do we criticize and scrutinize and judge until the person is no longer with us and THEN share such stories of generosity and love…stories about the joy brought to others. Why is it so hard to be so encouraging during the LIFE of a person. What would the world look like if we stopped with the negative talk and started telling people about the good they have done; the impact that they have made in our lives. Stop comparing and criticizing and judging; instead, go out of your way to share the GOOD! We all have people in our lives who have made a difference. People who have brought joy. People who have done something that seems so small but these things have made a lasting impact. So here is the challenge. TELL THEM. Don’t wait until it is too late. Don’t let a person feel inconsequential when the influence they have had in your life is substantial. Imagine what a different world we would live in if we all went out of our way to constantly encourage one another and to thank people for the things they have done that have made a difference in our lives. 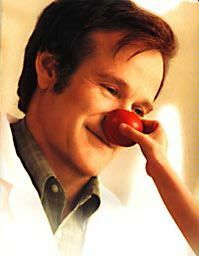 I wonder if Robin Williams knew that all of those times he made phone calls or stopped by a cafe table and offered a laugh had such a lasting and significant impact on people…I wonder if the people who have made a difference in my life know that….what about yours? Very convicting and well said, Chantal! Thank you for your friendship over the many years we’ve known you. Every moment has been precious…through fun and laughter, heartache and pain. Thank you for using your life to inspire so many others. YOU are a blessing!! thank YOU! the influence you guys have had on my life is definitely significant! you have been and always will be a fantastic example to me!